Jlab is renowned Exporter and Manufacturer of Operation Theater Fumigator, Operation Theater Fumigator Suppliers, Operation Theater Fumigator Manufacturer throughout the world to be used in Schools, College and Universities. Jlab is a Manufacturer and Exporter of Operation Theatre Fumigator. These OT Fumigators consume negligible power and just about need no maintenance.Jlab provides Operation Theatre Fumigator to suit the necessities of every and each medical community. These Operation Theatre Fumigator area unit utilized in most of the Indian hospitals and Dispensaries. Jlab has additionally earned a decent name from the international community in concert of the simplest quality Operation Theatre Fumigator Manufacturer from Republic of India. whereas producing these Operation Theatre Fumigator highest quality standards area unit followed. 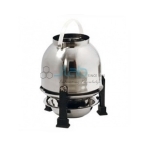 Operation Theater Fumigator Manufacturer, Operation Theater Fumigator Suppliers, Operation Theater Fumigator Exporter, Operation Theater Fumigator India, Hospital Surgical Equipments.